I had a nightmare on Wednesday, after I’d spent a few hours Magic Erasering the walls of my old bedroom to the point that my fingertip started bleeding. This ended the cleaning session, as the blood negated much of the erasers’ magic. It also may have planted the seeds for the bad dream. The narrative is simple: Much as I had in real life, I was standing in an empty version of my old bedroom, staring at plain white walls and rubbing the eraser in circles until every muscle in my arm ached. Unlike the actual version of events, I soon noticed that my fingers had actually started to pass through the wall itself — then wrists and then elbows. Around the time my face would have entered the now permeable drywall, I woke up. I’m not sure if dream me’s panicked yelling translated to any noise in waking life. It stuck with me, this awful little movie that my brain invented without my permission. The next day — my last ever at the old address — I kept thinking about it, especially when I was standing in front of some vast expanse of white, sponging and essentially setting myself up for a reenactment of “Wacky Wall Washing.” Dreams don’t necessarily mean anything, I say, but that doesn’t mean that random images flashing in the night can’t be considered in the context of what happens during the daylight. 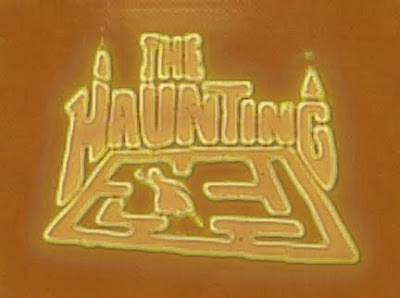 For example, the night before the dream I watched TCM’s showing of The Haunting — the good 1963 version with Julie Harris. I’d seen it before, but I think I enjoyed it more the second time through, possibly because part of me related to Eleanor’s simultaneous attraction and repulsion to Hill House. Eleanor feared it because it was populated with ghosts, and I had come to hate my house for its oppressive stench of nostalgia. (Not helping the haunted house movie comparisons: The fact that my last few days cleaning it involved dodging spiders of every conceivable variety as they literally came out of the woodwork, all while the usually windy weather caused a spectral slamming of all the doors inside. Cue string section’s jump scene score.) I never thought I’d come to hate the old house: I loved it for a long time, and I have a lot of nice memories there. However, most of those memories involve people who aren’t around anymore. Just existing inside those walls had become a little painful, especially walking from one room to the next and thinking “This is where this happened. That is where that happened.” And then there’s the fact that the house itself is falling apart. In addition to being impossible to keep clean, the wood and metal that make up the house itself are decaying, almost as if collective memories were condensing inside, dripping down the walls and rotting through the walls. Although I’m happy at the new place, where I’ve been living for almost a week, I will still miss the old one. That house had character, as everyone who visited had noted. (I imagine now that these friends used character to mean “dust,” “an odd floorplan,” “mismatched paint,” “no apparent living room,” “hardwood floors that are rapidly softening.”) The house was more of a character than anyone who ever lived in it. The day before the move, I told Aly that I felt like it wouldn’t happen — somehow, it would end up that we had to stay, because the house itself wanted us there, because the house wasn’t done with us. Just the fact that I started imagining that the old place had agency is probably a sign that it was time to get out, but I think these thoughts are especially telling when considered alongside a dream in which the house itself absorbed me into the walls. Too many movie characters who go traipsing about in haunted houses never get out in time. Instead of running out while the front door still opens, they go deeper, into gloomy basements or dusty attics where evil things live, as we all know. I suppose I should be happy that I’m out now, sitting in a new place where all the ghosts were presumably packed up by the previous tenant. It’s an inappropriately beautiful October 31, and as I write this my bedroom is lit by a late afternoon glow the likes of which I would have never seen from my desk in my old bedroom. I don’t care if the sentient, villainous house shows up in dreams again, because at least I know now that I’ll be waking up surrounded by new, more trustworthy walls. This is gorgeous and haunting and moving. Well done! If I were allowed to wear hats at work, I'd take my hat off to you. Who Gives a Fig About Sydelle Pulaski? The Effects Come Out of Where?